It is 9 December 1986, and 31123 is already expecting snow as it approaches Didcot North Junction with the 3V19 09:35 Oxford to Old Oak Common empty newspaper vans. 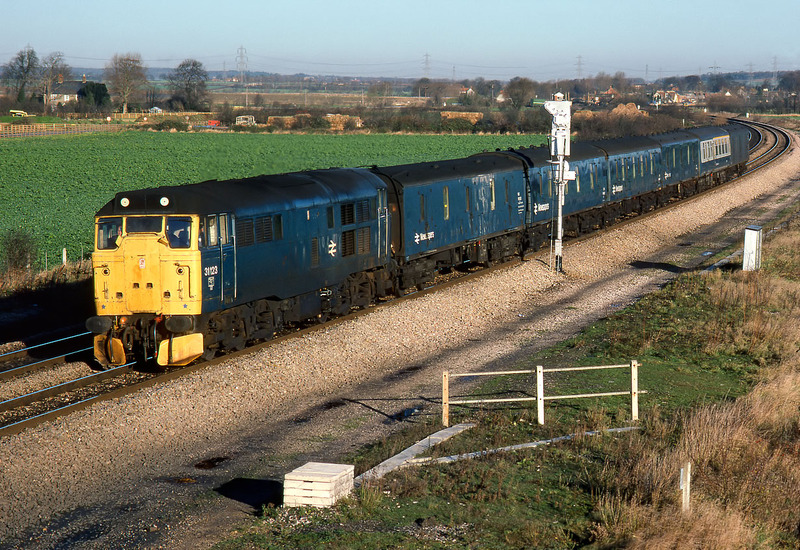 I haven't got many pictures of snowplough fitted 31s in BR service, and this is also the only time I saw this particular locomotive on the national network. However, I later photographed it extensively during its second career as a preserved locomotive on the Gloucestershire Warwickshire Railway. Unfortunately that was not permanent, and the locomotive was broken up in 2006.